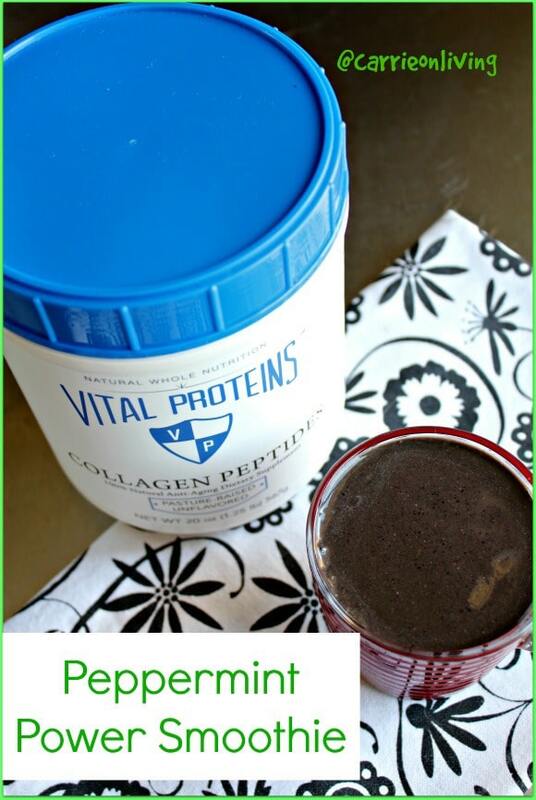 This post includes a recipe for a dairy-free Peppermint Power Smoothie using protein from collagen. Something I’ve been researching and working on very hard this past year has been to restore my gut health. 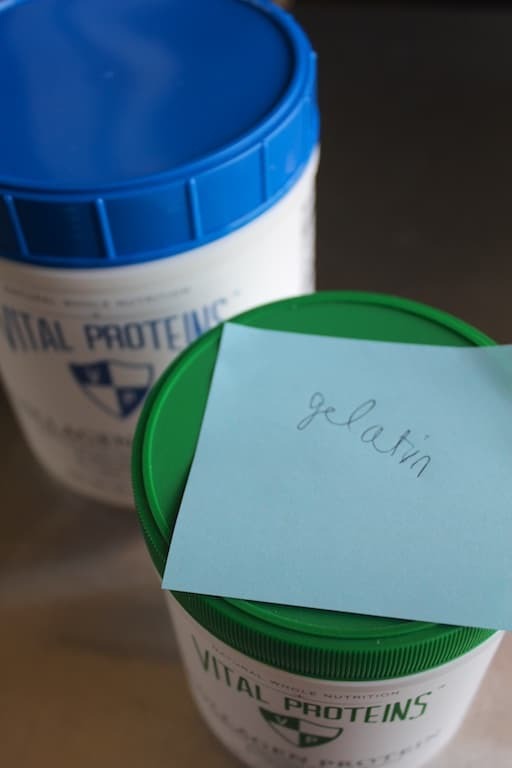 Outside of taking pre- and probiotics and sipping homemade bone broth, one of the easiest additions to the gut health department has been adding collagen protein to various recipes, one of which I’m sharing today. 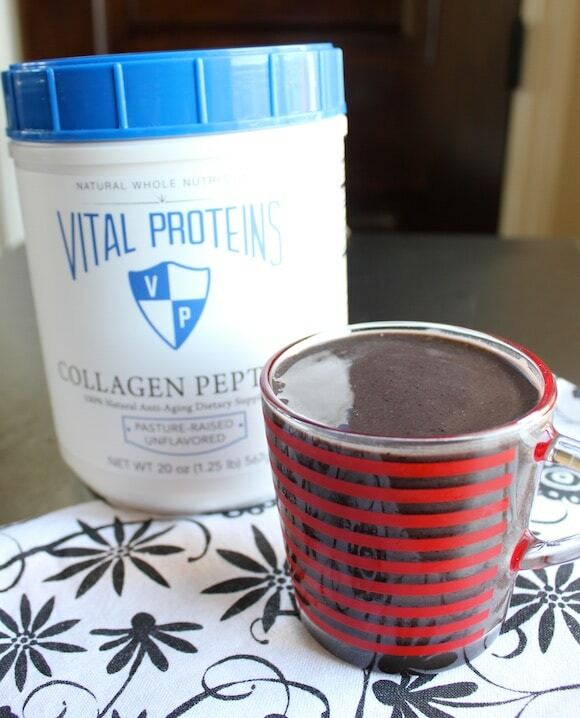 When it comes to selecting a brand of collagen to use, the source is of the upmost importance. In other words, you want your supplement to be from pastured-rasied cattle (i.e. the stuff that we used back in the day to make jello treats is not going to cut it). Again, the blue-topped Peptide version is meant to be incorporated into foods where it may not necessarily get dissolved by heat. 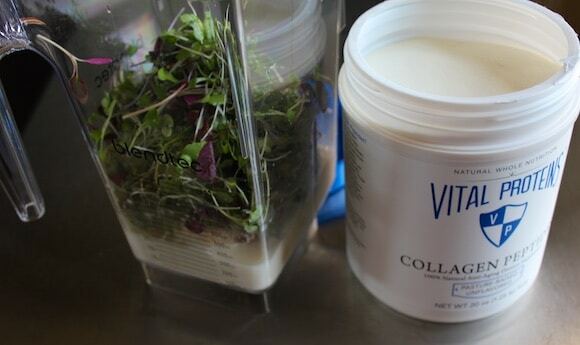 In other words, the Vital Proteins Collage Peptides is an amazing ingredient for green smoothies and adds a nice amount of easily digestible protein. *As always, please consult your health professional before making any changes to your diet or supplements. 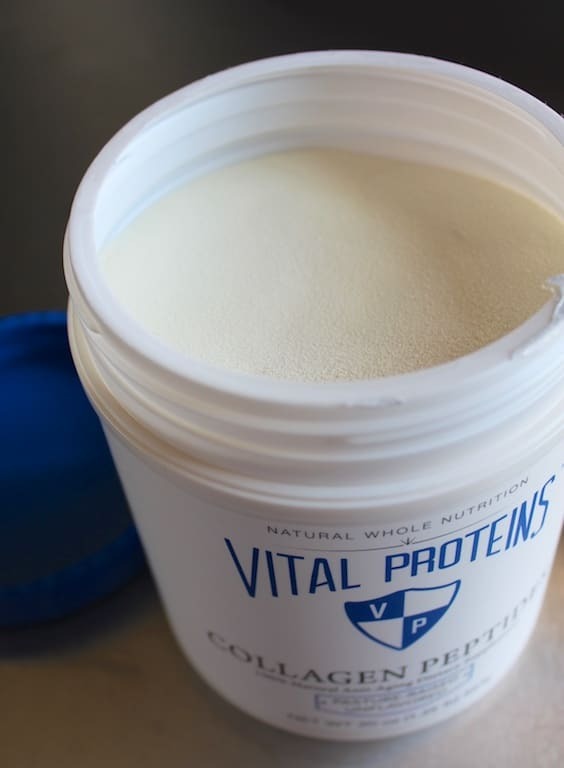 I’ve been using both versions of Vital Proteins collagen supplements for several weeks now, and I noticed an almost immediate improvement in my gut health, such as fewer skin reactions to food. Woo-hoo! 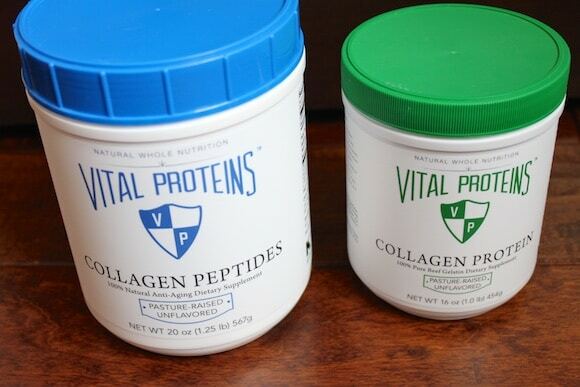 Vital Proteins has generously offered to send one lucky reader a container of the peptides and the collagen (a $68 value). Giveaway open to residents of continental U.S., except Rhode Island. One winner will be randomly selected on Tuesday, April 7th, 2015, and notified by e-mail. I will forward the winner’s information to the company and the giveaway prize will be sent direct from the company. By entering the giveaway, you consent to allowing me to provide the company with your e-mail address for promotional follow-up. This peppermint smoothie sounds delicious, I would never have thought to put mint leaves in, I always have a little patch in my garden growing, I’ll give it a try in my next smoothie for sure. I haven’t tried this brand before but I love putting gelatin in my banana, coconut milk and cocoa smoothies. I’ve also love adding it to my kids berry smoothies. You know, I thought they were but I checked the container and it didn’t say it anywhere. Glad to hear! Great giveaway! I make an at-home version of Wegman’s Green Glory Juice and add a scoop of collagen. I’ve been struggling with a generalized rash that started 1 week after Influenza B in Feb. I’ve been ‘Plant Based’ for 3 years now, but this has thrown me a big curve. I’ve been on steroids 2Xs and steroid cream…MD has me on Zyrtec (but increasing doses make me tooooo sleepy) Finally saw a Naturopath who said I needed ‘gut healing’ . She said I wasn’t digesting or absorbing minerals etc. She has me on a potent probiotic for a month, digestive enzymes & Quercitin (for Mast Cell desensitization) She suggested an elimination diet (which gluten is my main culprit) but that is SOO hard. I have freaked out that my diet has caused this & have started some meat this week (pasture fed) Frustrated that 3 years of working to eat right has come to this! I have found encouragement in your blog that you have been able to go another path for health. I started this for health reasons (seem to follow my mom’s health history & she ended up with a stroke -paralyzed last 7 years of her life) Also, I’ve worked 38 years in a Surgical ICU- and am not willing to go ‘under the knife’ myself! Will be continuing to follow you for inspiration! 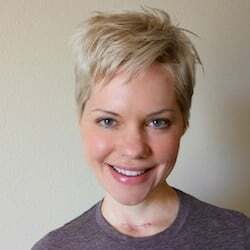 Wow, thank you for sharing your story, Beth, and I’m so sorry that you’ve had to deal with the health issues you described. If there are a few things I’ve learned on my circuitous health journey, they are that the body is a lot more complicated and unique that we realize, but that the body is also made to heal, even if it takes some experimentation to see what works best. So, I guess my point is to stay positive and strong, keep doing research, and keep listening to those cues and signals that your body gives you. Sending you much love and strength. I’ve never used collagen before, but would love to try it out! 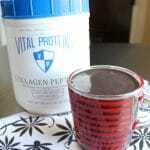 I hear a lot of good things about Vital Proteins and am always up to try something different. I’ve been following the autoimmune protocol for three months with no benefits, and I think the next step might be to eliminate the fish and chicken I’ve been eating to make sure they’re not part of the problem. I really don’t like meat (especially red meat), so I’ve been thinking of using this stuff instead on some days. The main problem I’m addressing is joint pain, so perhaps it will help with that, too. I’ve not used collagen before, but it sounds like something I need. Hi Carrie! I’ve been following you for sometime now and love your posts. I’ve seen you talk about this product and have decided to give it a try! I’ve read somewhere that the Vital Proteins are also good for hormone balance. Is this true or have you noticed a difference in yourself from this? Thanks for the sweet words, Traci! Wow, balancing hormones is one benefit of collagen that I haven’t heard of. I’ve only been using the product for a few weeks, so it will take me longer to know if it has that effect on me. If you find the link where hormonal health and collagen is discussed, please send it my way. XO! Are you mixing the gelatin into hot beverages? I’m doing that too, Rachael! Love it!!! I bought some collagen but haven’t used it yet. I haven’t tried making anything with collagen yet! I’m just learning about it, and I’m excited to try something! 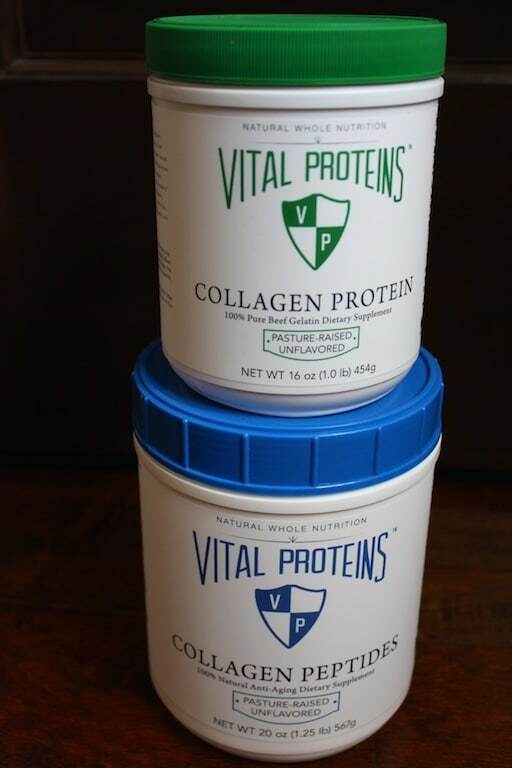 Well I just ordered some of the collagen protein and I used your link, so hopefully you get the credit! I’m not going to lie, I’m super unexcited about using it, but I decided to give it a try since at the ripe old age of 34 I have osteoporosis and now I also have some osteoarthritis and degenerative cartilage disease as well. Ugh. Hopefully the cows don’t mind helping me out… Do you think if I make jello shots with it, that would negate the benefits? That might make it easier to get down. Ha ha. Oh thank you. The emotional piece is giving me a really hard time. I have lots of not so pleasant images stuck in my head and it’s hard to get them out again… I have been mostly sticking with fish at this point (from Vital Choice, which it occurred to me that I haven’t been ordering from your affiliate link – do you know if I call them now after that my past orders can still be credited to you? I’ll have to be sure to use your link in the future. Sorry!) but did try some chicken as well, but it’s so extra “fleshy” tasting that it was too hard. I also have a really hard time with cows… This is so hard. But the good news is that I too have had tremendous improvements in my health since adding in the fish. It’s actually quite amazing. And I never would have had the courage to do it and stick with it, if it hadn’t been for you, so thank you so very very much. But back to the gelatin, thanks for the recipe. That looks like it could be a good way to go. On top of my issues with eating cows, I also have issues with eating jello. I was traumatized by it as a child. My mom would send me green jello with onions in it for lunch when I was a kid so I’ve never been particularly fond of it as a result. Ha. And I just really hate the texture in general. Bleh. But maybe these little blueberry squares won’t be so bad. Thanks so much for the recommendation. I’ll give them a try and let you know how they turn out. And I look forward to reading more about what you’ve been doing with it! In regards to the gelatin, there is an interesting article from a dietitian (the one who I worked with) here about some of the reasons why someone would want to consider consuming it: http://www.ancestralizeme.com/5-reasons-why-even-vegetarians-should-eat-gelatin/. I also thought it was interesting that Laura mentions at the end of her article that gelatin comes from parts of the animal that might not have been used otherwise. On a lighter note, green jello with onions?!? That sounds AWFUL!!! If you aren’t cool with that texture, and I now I certainly understand why, I’ve even made a version of the Jello with twice the amount of gelatin. In that version, the gummies got really, really firm, almost like a jujubee, so something like that might appeal to you? HUGS, Sarah, and LMK if I can offer any other support. Just the thought of peppermint makes me feel excited to try this one too! Thanks Carrie for the great recipes!